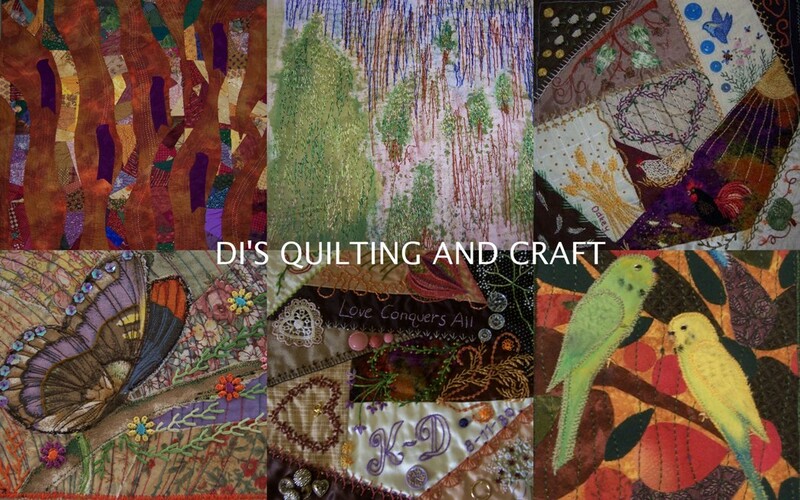 Dinky Di Quilting & Craft: Playing with Fabric Painting and finishing a Thread Sandwich! Playing with Fabric Painting and finishing a Thread Sandwich! Time is flying by and another month has cruised past me. During the month of May a small group of us have been meeting at a friend’s house to play with all manner of textile things. Fabric painting, stamping and making our own cord among other things. Here is Linda showing us some of her creations and explaining what we can do with our fabric paints. The following technique is done with a wire rack. Starting in the middle, poke your fabric through the holes using the end of a paintbrush. This is mine and I have dabbed the blue paint into the wells and the green onto the surrounding fabric. The pieces are laid out to dry. My finished piece which looks a little bit like little blue pansies. We also used the fabric paints in a shaving cream marbling technique. It was a lot of fun and yielded some amazing results. I used some left over paint and shaving cream and did this stencil with it. We then did a sun print. Firstly we painted the fabric with fabric paint, laid out our objects ( we used bracken fern leaves ) and then laid the pieces out in the sun to dry. This is my finished sun print. (In between the leaves I sprinkled some lentils). Very happy with it. Now for a long overdue finish!! Last year we did a thread sandwich at art quilting with Linda Wrench. It is just a matter of cutting up all little pieces of fabric, ribbon, braid, thread etc etc and laying it out on a base. Then we covered this with water soluble stabilizer and free motioned quilted all over it. I made this little green box with mine. It is a pattern from a Stitch magazine and was quite easy to make up. I embellished the piece with a little bit of bling and made the cord with Linda a few weeks ago using wool and thread I had in the stash. We are about to go away on another trip to the bush, but I hope to post more of what I have been up to over the past few weeks in the coming days. It is a busy time trying to pack and get organized for a big trip, but I still managed to start yet another quilt this week. This one is for our daughter’s partner and I am doing some hand embroidery on it, so I just wanted to get it to a point where I can take it with us and perhaps do some on the trip. Also, I am on a time line – it has to be finished by early next year for his birthday!! Wow, Di, your thread sandwich box is gorgeous! Loved seeing your pics of the experiments in fabric painting. Wow, so many greeat experiments! Love the fabric with the leave. Love all your experiments Di, your little green bag is gorgeous. Will miss you but have a great holiday. can see you had the most enjoyable time with friends and such creative pieces resulted.The sun fabric has worked so well, shame we get so little sun but must try it sometime. I have also done that bag from Stitch hope you will try my biscornu that is on the latest stitch magazine. Hello DI, You have been very busy learning all the new media craft, it looks really wonderful. The fern leaves are lovely on the fabric. The thread sandwich box is beautiful. Have a great trip. I get home from our 7 1/2 week trip tomorrow. I really enjoy doing those techniques with the sun reactive paints also. So many beautiful effects can be achieved. Your green box is beautiful with all its bling. I loved playing with Linda and her paints - so many great effect! Love that box you made - divine! Enjoy your trip!